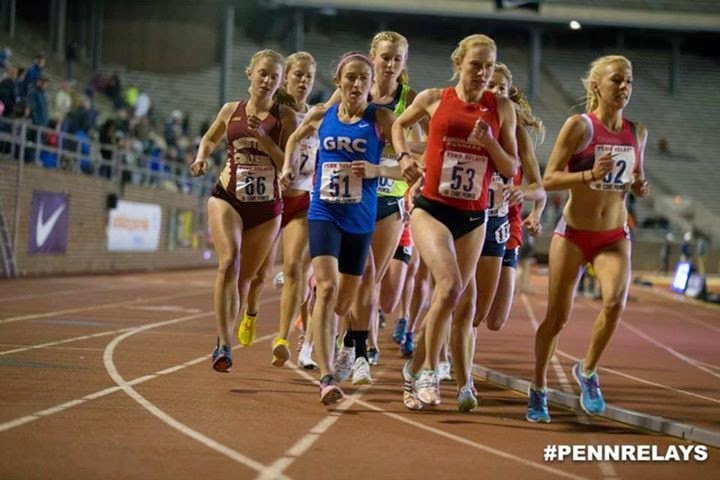 Four GRC athletes are traveling up the Northeast Corridor this evening to take part in the largest track meet in the country, the 122nd Annual Penn Relays. More than 22,000 athletes take part in the yearly event, more than will participate in the entire Olympic Games in Rio De Janeiro, which starts in 99 days (who is counting?). Although this evening's events won't pack the Stadium as they will on Saturday for the USA vs. World and Calabar (Jamaica) vs. Kingston College (Jamaica) relays, GRC's enthusiasm for high-caliber competition against top collegians and post-grads remains high year in and year out. If there is any doubt, take a peek at the GRC top-5 lists, and you will see mark after mark run at Franklin Field. A GRC athlete has won an event at historic Franklin Field the past two years. Phil Royer, Stewart Reich, and Frances Loeb will try to match Frances Koon's 2015 victory in the 5000m. Stephanie Reich will try to match Mike Franklin's 10,000m victory from 2014. Coach Jerry says that Phil "on a good night could move into the #2 slot on the all time list" and Stew is looking to "significantly improve" on his recent 5000m PR of 14:58. Frances L. is also knocking on the door of the GRC top-5 list. In the 10,000m, Stephanie will absolutely run a GRC top-5 time, and is looking to run a big PR. She has been peaking for tonight, and Jerry believes that "she has a real shot at running under 34:20." The heat schedule is below, and the races are being streamed on FloPro via Flotrack. As always, we'll keep you updated with flash results and breaking news. Send 'em.